Here in NJ it is rare but, on occasion, we are lucky enough to wake up Christmas morning to a soft dusting of snow. A white Christmas is something we always dream of and it certainly helps to add to the magic of Christmas. We're dreaming of a white Christmas this year, so it's only appropriate that our last color day before the holiday represent just that! Glistening tree tops, sleigh bells ringing and fluffy, white, blankets of snow are part of what makes this season so beautiful. 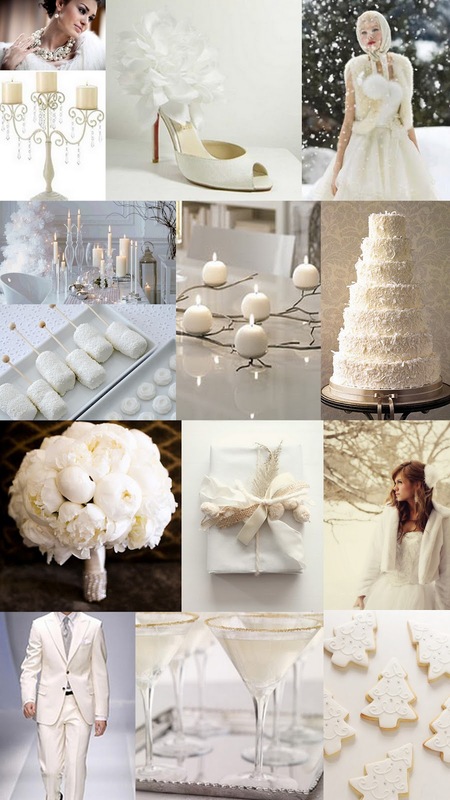 You can go with cool white and silver for an icy mix or warm white and gold for a fire-side glow. This board shows a little bit of both worlds with a mix of cool and warm whites that captures the essence of candle lit, cozy snowy evening.